As a member of the 500 Home Run Club, Harmon Killebrew baseball cards and autographed memorabilia carry values consistent with his Hall of Fame credentials. 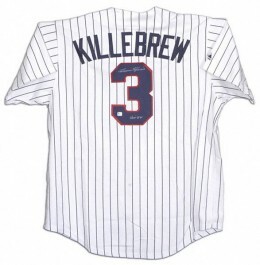 His 22-year career was spent predominately with the Washington Senators who then became the Minnesota Twins. He was a 13-time All-Star and six-time Home Run Champion. 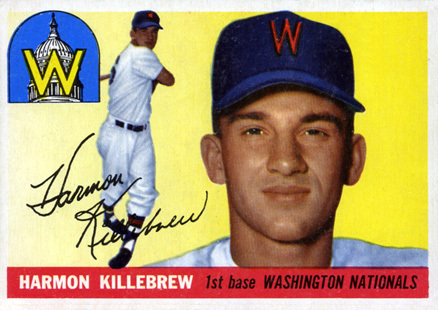 Harmon Killebrew's rookie card is part of 1955 Topps Baseball. He has the added distinction of being included in the harder-to-find 1955 Topps Doubleheaders set. These Doubleheaders pair two players from the first series of the regular Topps issue. Killebrew is accompanied by Johnny Podres. The cards are folded and, when opened, the player image appears in full. The design concept was taken from the T201 Meca Double Folders set. Killebrew's first certified autograph card is part of the 1991 Upper Deck Heroes of Baseball set. The card is numbered to 3,000 total copies, which, at the time, was considered rare. Fittingly enough, Harmon Killebrew's first memorabilia cards would also be produced by Upper Deck. 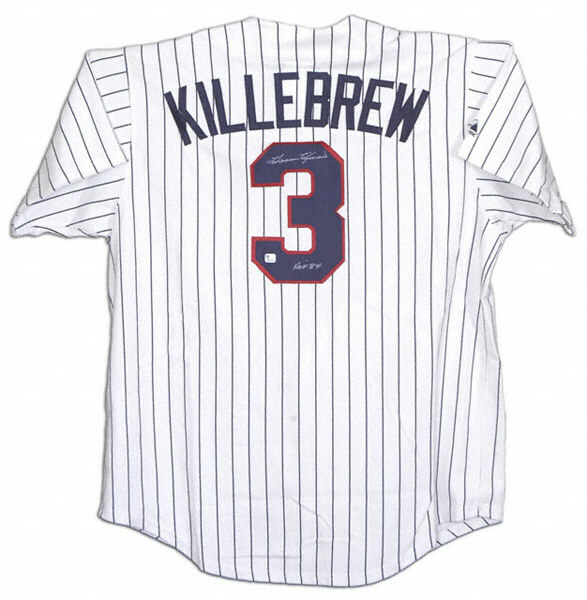 In 1999, Killebrew was included in the iconic, Piece of History 500 Home Run Club set. With an unnumbered print run of 350 total cards, each contains a piece of a Killebrew game-used bat. Three additional copies also include an autograph. Over the years, Killebrew signed a lot. He was a near-constant presence at autograph signings and sports collectibles conventions. He also lent his signature to many trading card sets prior to his passing in 2011. 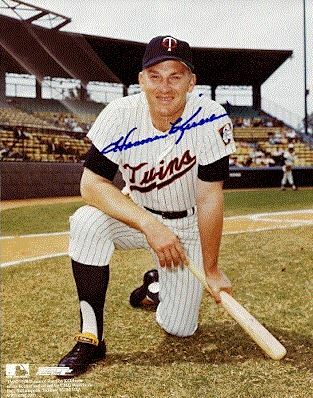 As a result, Harmon Killebrew autographs are among the most affordable of the 500 Home Run Club members. Killebrew gained publicity for calling out ballplayers whose penmanship was less than acceptable in his eyes. These stories still pop up with regularity. What that ultimately meant for collectors was a crisp, clean, easily legible signature from the Twins great. A classic set from the Golden Age of baseball, 1955 Topps Baseball is a favorite among vintage collectors. Featuring a vibrant yellow background on the right that fades to the left, the card features two, full-color images, a head shot and a full body action pose. The team logo graces the upper left-hand corner. A red banner along the bottom houses the players name, position and team. A facsimile signature also accompanies the other design elements to create one of the best looking baseball card sets ever created. 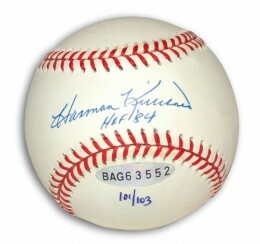 Below you will find an example of what Harmon Killebrew's authentic signature looks like. This can be used as a first point of reference for determining the legitimacy of autograph memorabilia, but is not a substitute for having your items authenticated by a well-respected professional autograph authentication company. Some of the trusted sources within the sports memorabilia market include the following companies: PSA, JSA, Steiner, Mounted Memories and Tristar. Click on any of the images below to view full size photos. The "H" is distinct in that you can make out a classic cursive "L" with a crossing line low on the horizontal plane that attaches a vertical line on a 45 degree angle. Classic cursive script is used for the remaining letters of the first name. The "K" again uses an "L" shape with a line on a 30 degree angle that extends above a good portion of the other letters in the last name. The "i" is sometimes dotted, with the "l"s having loops. His signature got smaller as he got older and as a result some of the openings of the vowel letters are closed. HARMON KILLEBREW 2018 LEAF CUT SIGNATURE HALL OF FAME EDITION AUTOGRAPH! TWINS!